The mysterious magnolia is part of the fossil record from 20 million years ago, but the bright flower imprinted on this magnolia ice/wine bucket from Arthur Court is fresh as spring. You don't have to be a southern belle to enjoy the elegant impression it leaves atop your bar or kitchen counter. Its crisp aluminum foliage envelops the magnolia centerpiece and branches upward into delicate handles to lend an upscale ambiance to your intimate get-together. Textured glass accentuates the organic metalwork and reflects the light off icy contents beautifully. 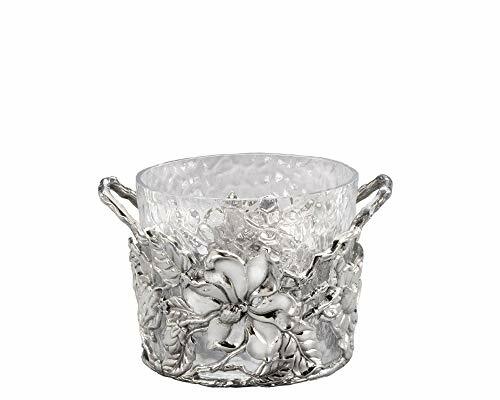 This 9 x 6-inch Arthur Court magnolia ice /wine bucket is compact enough to stow away in cabinets and curios, and is lightweight for easy portability. The fragrant flower sometimes takes 10 years to bloom on young trees, but you can enjoy its ageless allure anytime with this intricate but durable barware.A brilliantly-defined magnolia stands out in the center of each side as foliage surrounds the flower as an accent. Handles branch off the leaves to form supportive handles, while the rippled glass reflects the handmade, aluminum design.